File Name: Cooper G. MacBride of Crosby, North Dakota. Notes: Crosby is a one-square-mile town in the state's northwest corner, six miles south of the border with Canada. The 1989 and 1993 filecards list the birthplace as Crosby, New Mexico, but there is no such city. Sunbow's Low-Light wore his 1986 outfit, but without gloves. The series indicated he suffered from nightmares because of a (verbally) abusive father. He was called by his given name Cooper in the episode Nightmare Assault. 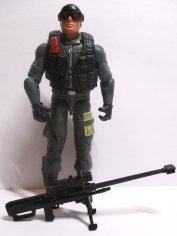 In the DiC series, he wore a variation on his 1989 outfit during Operation Dragonfire (brown shirt with tan backpack straps and light blue shoulder pad and grenades; green pants with brown camo spots), and his 1991 outfit in seasons 1 and 2. DiC's Low-Light was often paired with Scoop, spoke with something like a Clint Eastwood impression, and suffered from a fear of ghosts. Once Upon a Joe 11 seconds (silent) riding in Shipwreck's H.A.V.O.C. Accessories: black simplified Uzi with trigger guard (new), black sniper rifle based on Enfield L39A1 with night scope and small H-shaped bipod (new), large black backpack with engraved canteen in lower right corner (new). As a child in North Dakota, Low-Light was afraid of the dark, timid with animals, and shy of loud noises...until one precarious hunting expedition with his father. Low-Light somehow lost his way in the impenetrable darkness. He was found three weeks later with his flashlight, .22 rifle, and a grin from ear to ear. Ten years later he was an instructor at the Army marksmanship program in Fort Benning and a self-taught expert on image intensification. "The Joes like to have Low-Light along for the ride. They know that if something gets really heavy, and that's bound to happen sooner or later, all they have to do is wait until dark... It doesn't matter what field of fire the bad guys control - the night belongs to Low-Light." Toy Notes: Item #6459. 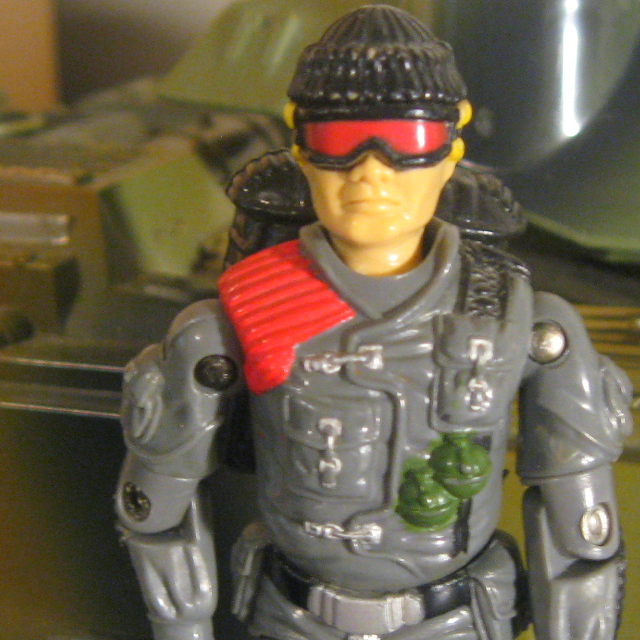 The prototype shown in the 1986 insert catalog has slightly different molding on his goggles and collar. Accessories: black Uzi (86 Low-Light's), black rifle and bipod (86 Low-Light's), black backpack (86 Low-Light's). As a child in New Mexico, LOW-LIGHT was afraid of the dark, timid with animals, and shy of loud noises...until one precarious hunting expedition with his father. Low-Light somehow lost his way in the impenetrable darkness. He wasn't found until three weeks later with his flashlight, a .22 rifle, and a grin from ear to ear. Ten years later, he became an instructor for the Army gunnery school at Ft. Benning. Low-Light is also a self-taught expert on image intensification. "The Sarge likes to have Low-Light along during night time missions. It's amazing to watch him guide the Marauders to their destination behind enemy lines, complete their objective, then get them out of there, all under a blanket of pure blackness! It's crazy, but Low-Light sees better in the dark than he does in the light." Accessories: large black Uzi with stock, scope, and flash suppressor (new), black knife with ribbed grip and serrated edge (new), black battle helmet with brim and pegs for visor (new), black night vision visor with red lens (new), black backpack with engraved canteen, clips for knife, and hole for flashlight (new), black rectangular flashlight with vertical grip (new). "It could be a moonless night under triple canopy jungle, the very air so dark you can hold your hand in front of your face and not know how many fingers you have up. You close your eyes and open them again and there's no difference! Suddenly, you hear something or somebody moving out in the bush, creeping towards you, but you're not worried; because you know that Low-Light is out there, too - and unlike whoever is sneaking up on you, Low-Light doesn't make mistakes!" Licensed to operate: Hammer, Avalanche, General. Accessories: black pistol (90 Skydive's), black lase rifle (91 Mercer's), black Uzi (91 Low-Light's), black machine gun (90 Airwave's), black knife (88 Hit & Run's), black helmet (91 Low-Light's), black visor (91 Low-Light's), black figure stand (common). As a child in New Mexico, LOW-LIGHT was afraid of the dark, timid with animals, and shy of loud noises - fears he obviously outgrew or he wouldn't have volunteered for THIS mission! Chasing dinosaurs through a thick jungle isn't going to be easy, but Low-Light never backs down from a challenge. It's amazing to watch him guide troops on missions behind enemy lines, and then silently get them out of there under a blanket of pure darkness. It's crazy, but Low-Light sees better in the dark than he does in the light! These skills will come in handy leading night assaults on Cobra Island while trying to capture dinosaurs in the dark - not exactly a typical day at the office!" Toy Notes: Boxed in a Walmart-exclusive set with Ambush, a modified recolor of the Desert Fox 6W.D., and a dinosaur. The figures from the set are considered moderately high-demand items, as well as moderately hard to find by themselves. Accessories: black Uzi (91 Low-Light's), black knife (91 Low-Light's), black helmet (91 Low-Light's), all-black visor (91 Low-Light's), black backpack (91 Low-Light's), black flashlight (91 Low-Light's), black figure stand (common). As a child in North Dakota, Low-Light was afraid of the dark, timid with animals, and shy of loud noises...until one precarious hunting expedition with his father .Low-Light somehow lost his way in the impenetrable darkness. He was found three weeks later with his flashlight, .22 rifle, and a grin from ear to ear. Ten years later he was an instructor at the Army marksmanship program in Fort Benning, and a self-taught expert on image intensification. Now working as a special agent with the CID (Criminal Investigation Division), Low-Light's workday begins when the sun goes down. Low-Light can precisely locate what most people doubt is even there. No dark hallway, back alley, or shadowy figure is beyond his tracking sight. It's as if he's invisible in the dark, but everything about the night is as clear as day to him. Like he has a sixth sense or something. COBRA once attempted a covert midnight attack through the San Andreas Fault, only to find Low-Light waiting on the other side! Don't even think about giving him the slip because no one knows the night better than Low-Light. Toy Notes: Carded in a two-pack with Sure Fire. Item #53042. Accessories: black pistol (03 Beachhead's), black Barrett M82 anti-materiel rifle with scope, and bipod with extended feet and pin to fit onto rifle (new), black goggles with dark red lenses (03 Black Out's), black vest with red shoulder patch (04 Gung Ho's). "It's crazy, but I see better in the dark than I do in the light. That's something the enemy should keep in mind when they start skulking here at night." Accessories: dark grey submachine gun (89 Snake Eyes's), dark grey rifle and bipod (03 Black Out's), dark green backpack (85 Dusty's), clear figure stand (common). Following a troubled youth, which romors say culminated in being abandoned in a junkyard at night, armed only with a simple .22 rifle, LOW-LIGHT not only conquered his fears but embraced tem. He became one with the darkness and further turned his abusive past into a drive to right wrongs - permanently. He is an expert in virtually every long range rifle, from the standard M24 or M40A3, to the vehicle-stopping .50 caliber M107 SASR (Special Applications Scoped Rifle) with a range of over a mile. He is also a master of field craft skills, and is constantly calculating terrain, props, ballistics, distance, and weather effects - even when unarmed. He is also that rare exception to the two-man rule which usually requires both a shooter and spotter. LOW-LIGHT's years of honing his trade eliminated the need for a second man - likely because he also prefers to work alone. His fellow Joes would rib him for having no social life, if they weren't afraid of seeing his laser scope pointed on them. After many local police agents disappeared investigating a mysterious factory in Eastern Asia, the G.I. JOE CID (Criminal Investigation Division) Commander suspects COBRA involvement and deploys a team of S.W.A.T. (Special Weapons and Tactics) experts. LOW-LIGHT gets the call and packs his gear for the mission. But, what can even the best sharpshooter do when the enemy is bulletproof? "I seize the day and own the night." Toy Notes: Bagged together with Shockblast and Long Arm at the Headhunters-themed 2008 Convention.